Villa Ralfa, the information site for gay and lesbian Crete, Greece, is a not for profit web site launched in 2004 and is based on the north coast of Crete, in an area known as Agios Ioannis (St. John), just to the south of Anisarras, which is about 20km east of the main airport at Heraklion, and about 3km west of the busy and very ‘touristy’ (read ‘naff’ at times) resort area of Port Hersonissos. The Hersonissos area is very cosmopolitan and during the summer you will find visitors from all over Europe as well as the USA and Australasia. There is also a very high resident population of non Greeks from nearly all of the European countries and Scandinavia too! Hersonissos, is also convenient places for visitors to stay as the main east/west National Road runs just to the south, and the Old National road runs through it to the north. This is the main bus route for public transport to the east, Agios Nikolaos, Sitia, and Ierapetra. The biggest archaeological site at Knossos is an easy bus ride away, as is the capital Iralkio where you will find the newly refurbished Archaeological Museum. Locally there are three ‘traditional’ villages, Old Hersonissos, Piskpiano, and Koutouloufari which have some very nice bars and tavernas where you can spend a pleasant evening away from the madding crowd of the Port area. Some more information about Villa Ralfa and about Crete, the island. Crete is the largest Greek island, and the fifth largest island in the Mediterranean. The history of Crete, which has been inhabited since Neolithic times, is a colourful one and the island is steeped in history and bears the evidence of occupation by the Romans, the Venetians, and the Turks. Indeed the Turkish occupation is relatively recent as it only ended in the 1890’s! Sadly the remains of some of these occupations has been dismantled although you can still see remnants of them around the island, such as the aqueducts built by the Romans, in other places such as Port Hersonissos, new 1970’s concrete hotels and other buildings have been built directly on top of them. In the modern capital, Iraklio, little remains of the Turkish and Venetian architecture as much of the city was destroyed by bombing in the last century. Crete is perhaps best known for the Minoan civilisation with sites such as Knossos, Phiastos, Malia, and Gournia, being amongst the most popular for visitors to visit. The scenery on Crete varies from dramatic soaring mountain peaks, some with snow on top until mid-June, to fertile plains producing fruit, vegetable crops, and, of course, some of the best olive oil in the world. Around the coast there are some world class beaches with warm crystal clear seas, some of these are quite crowded while others are rarely visited and attract many naturists! 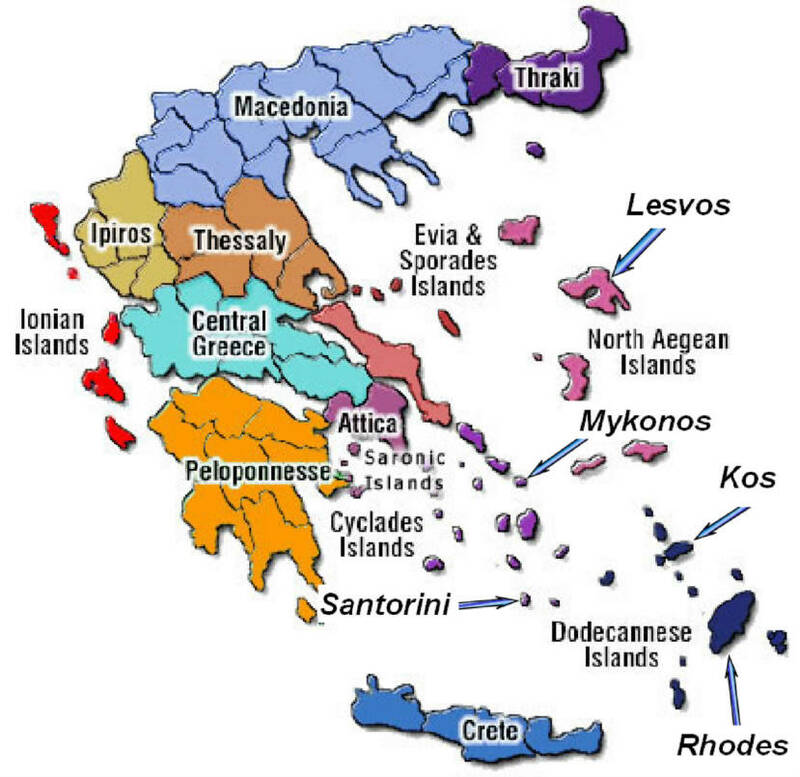 The map above gives you some idea of the size of Crete in relation to the other Greek islands!